In the United States of America, approximately 6 million children suffer from IgE-mediated food allergies. Although fatalities from food-related allergic reactions at schools are low, approximately 18% of allergic children have experienced an allergic reaction whilst at school, and 10% of schools have reported at least one anaphylactic event during the 2013-2014 school year. The United States Department of Education has not yet established food allergy policy recommendations in order to avoid such events, and the current management of food allergies at schools is primarily based on strict avoidance of known food allergens and after-the-fact responses to accidental exposures. Mustafa et al investigated the parental perspectives of school food allergy policies via a survey, to determine what prevention and response measures parents are aware of, their effectiveness, and the additional food allergy policy needs as perceived by parents. Their study reports that most schools have at least one food allergy policy in place, but parents are still concerned about the safety of their child in school settings. The areas of focus for policy improvement include the availability of epinephrine stocks, improved allergen labeling at schools, increased food allergy education, and an improvement in communication between schools and parents about the policies that are already in place. Celiac disease is an auto-immune condition that is triggered when those affected consume food products containing gluten. This immune reaction damages the surface of the small bowel, which leads to malabsorption and mineral deficiencies. Two commonly known vitamin deficiencies in those affected by Celiac disease are the fat soluble vitamins D and K. Deficiencies in these vitamins often lead to osteoporosis, hyperparathyroidism and hemostasis disorders. Although adults diagnosed with Celiac disease are routinely screened for fat soluble vitamin levels, there is no routine evaluation for pediatric patients. In their paper, Tokgöz et al investigate the need for such a routine in young patients. Their results showed that vitamin A and D levels of pediatric Celiac disease patients were significantly lower than those found in the control group, and the majority of patients suffered from an insufficiency or a deficiency for these vitamins. However, no vitamin E or vitamin K1 deficiencies were determined in pediatric Celiac disease patients. Following these outcomes the authors suggest that routine evaluation of vitamin A and vitamin D levels may be beneficial for children diagnosed with Celiac disease. Participation in activities and settings that provide challenge, social engagement, belonging, and autonomy is an essential part of child health. However, children and youth living with disabilities experience significant participation restrictions, especially when physical activities are involved. While there is clearly a need to develop successful interventions that promote participation in physical activities for these youngsters, there is limited understanding of the mechanisms and processes that enable a change in children’s participation outcomes. The rehabilitation center Beitostolen Health Sport Centre (BHC) in Norway runs a Local Environment Model intervention that seeks to enable lifelong activity and participation for people with disabilities. Outcomes observed from this program indicate that physical activity participation may act as a catalyst to promote meaningful responses across all levels of the International Classification of Functioning, disability and health. In their paper, Waterfield et al systematically review how and why the pediatric program at BHC works. They provide new knowledge on the mechanisms and contexts that may enable participation in activity for children and youth with disabilities, which may be of particular value for policy makers, researchers and health professionals involved in the development of pediatric disability interventions. The United Kingdom currently follows the National Institute for Health and Care Excellence (NICE) standards of practice when it comes to treating young febrile infants. As this group of pediatric patients is considered at high-risk of invasive bacterial infections, they are frequently treated with parenteral antibiotics. In order to balance the risk of serious bacterial infections in young infants with prevention of the spread of multi-drug resistant bacteria, tests are being developed to identify young infants with very low risk infections, from whom antibiotic treatment can safely be withheld, and young infants with high-risk infections, which require urgent parenteral antibiotic treatment. One such test is a point-of-care test (POCT) for the biomarker procalcitonin. This biomarker is a precursor for the hormone calcitonin, and is usually present at very low levels in the blood of healthy individuals. However, the blood levels of procalcitonin are significantly higher in patients that suffer from sepsis or septic shock, and therefore has the potential to act as a biomarker for invasive bacterial infections. In their study, Waterfield et al assessed the diagnostic accuracy of point-of-care testing for procalcitonin in identifying young infants with invasive and non-invasive bacterial infections. The researchers conclude in their report that this tool demonstrates excellent diagnostic accuracy for identifying young infants with invasive infections. A tool such as this may be crucial for the improvement of early recognition of serious bacterial infection in very young pediatric patients. 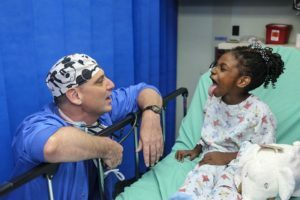 Pediatric patients in emergency departments, hospitals, and ambulatory settings frequently suffer multiple painful procedures. Evidence-based pharmacological and psychological interventions are available to manage and reduce pain, but they are under-utilized or used inconsistently. The lack of sufficient pain management in children may lead to short-term side effects such as anxiety, avoidance behavior, and somatic symptoms. Additionally, in the long-term, it may increase sensitivity to pain, fear, and health care avoidance later in life. Furthermore, the pain suffered by pediatric patients often results in parental or caregiver distress and anxiety during their child’s procedures. Optimizing the management of pediatric pain has been highlighted as a key healthcare priority by the World Health Organisation. Among the most common painful procedures are venepuncture and intravenous insertions. In their study, Willis et al have identified information needs for caregivers whose children are subjected to these procedures to develop a knowledge-translation tool that will allow caregivers to understand how they can help to reduce and manage pain. Empowering the caregivers to take on this role is an important step in procedural pain management.